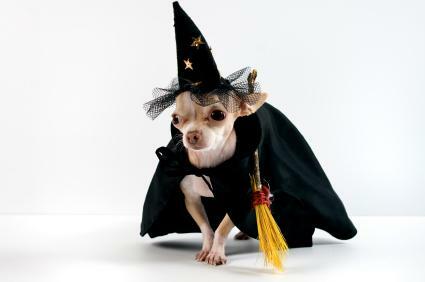 Whether for Halloween, an Easter parade or a Harry Potter convention, pet owners can come up with some pretty wild dog costume ideas to get their four-legged friends in on all the dress up action. As long as your canine companion is comfortable and easy going about all the silliness, you can all have a lot of fun. With some clever originality, perhaps Fido will even win a contest. Costume ideas for dogs can range from simple to extreme. There are many ideas to consider that are sure to delight any pet owner. Some of the simplest and most basic dog costumes involve dressing your dog as another animal, usually in another genus. Animal costumes are all readily available, inexpensive and easy for the dog to wear. Dogs aren't given names like "Rex" or "Queenie" without reason. They are often the rulers of their little kingdom in your home and if you treat them like royalty, it stands to reason that you would dress them as such on occasion. Simple royal costumes include capes and soft crowns and perhaps the occasional, yes, ruff! These costumes are fitting for lap dogs and purse puppies. 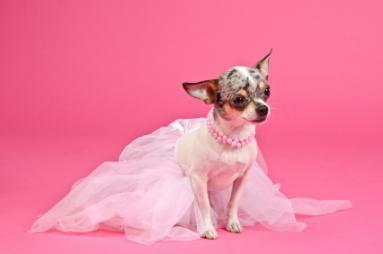 You can accessorize with jeweled collars and tiaras if your dog will tolerate them. Just be sure the items don't pose a choking or strangling hazard to your pet. Pretty Princess includes crown and light pastel dress. King includes a crown. Any dog will feel like royalty when donning this cute costume. 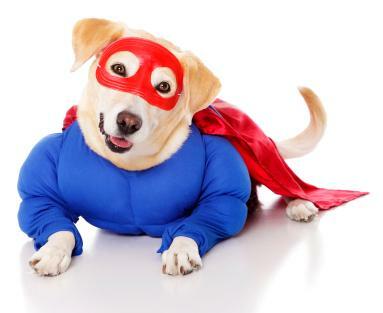 Superhero costumes have become very popular for dogs because not only can they personify the way many people think of their pets, but the costumes are very funny. The clever design of many of the superhero costumes builds in little arms, so that once your dog's front legs are encased in the costume's legs, it then looks as though the hero is a tiny person with a dog's head. Check out a costume like the Spider-Man dog costume at Costume Craze. This costume includes a shirt and headpiece done in red and blue with black spider web design. The look of the tiny arms is so appealing, designers and clever owners are continually setting their minds to more costume ideas that make their dog a small, funny-looking human. Nuns are a fun option as are construction workers, sailors and Indian chiefs. 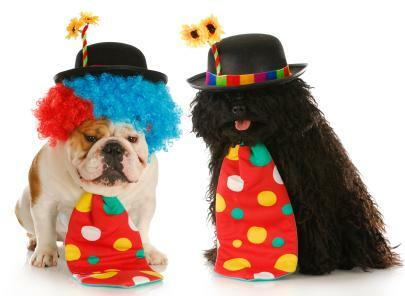 If your dog keeps the family entertained, consider dressing him as a clown. Party City's clown costume comes with a ruffled collar and hat done in red and yellow with green and blue dots. A cheerleader costume such as the one at BrandsOnSale is another appropriate choice for a fun-loving pet. This one comes with faux hands holding blue and yellow pom-poms. Candy Corn Witch, found at Petco, comes with a hat, orange lace-up bodice and an orange skirt. Blue Monster from Rubie's Costume Company includes a blue fuzzy hood and cuffs. These types of costumes can be found online at sites such as Halloween 4 U. Play up your dog's trouble-making nature by dressing him as a convict, devil, or a pirate. Or, go for irony by dressing your pet as an upstanding citizen. Try costumes such as a Doctor or a Sheriff. You can also dress up a dog to take with you to Cosplay events and Faerie parties and festivals. This can be a great way to use remnants and scraps accrued from making your own costume. For these events, you definitely want a homemade costume so your dog better looks the part. Dogs can also be dressed in period costumes if you bring your pet to the Renaissance Faire or something similar. Dogs were often dressed in fancy ruffs to match their wealthy owners in this era, so you'd actually be correct for the period. But if you want to get very silly, you can dress your dog as a knight of the round table, Robin Hood, or Henry VIII. You can also dress a pair of dogs as knights preparing to joust; just be sure that the armor doesn't cover their eyes. Whatever unique option you choose, make sure your dog is comfortable and showered in treats for being such a good sport! Before committing to any costume idea, try it on your dog first to see how he reacts.